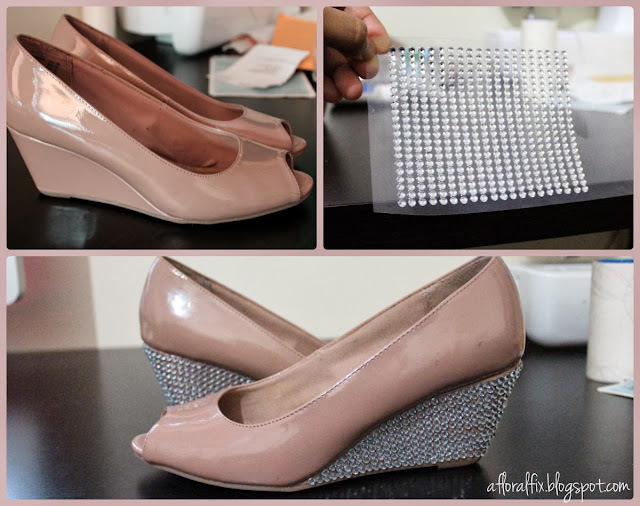 A few weeks ago I came across a pin called “DIY Crystal Shoes”. If you want to check it out here is the link to the website. The blogger used Swarovski crystals and meticulously glued them on to a pair of satin wedges. The result was very beautiful and inspirational. As such, I decided to create a version of my own that is more affordable and less time consuming. 1. Begin by cleaning your shoes. Any dust or dirt will prevent the rhinestone from adhering. 2. The adhesive rhinestones that i purchased peel off row by row. 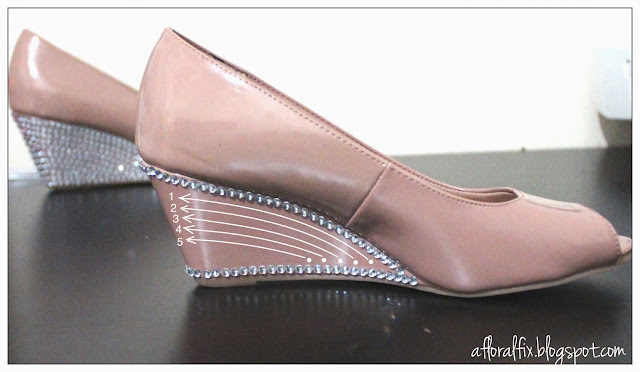 Place a single row of rhinestone outlining the wedge. 3. Continue to apply the stripes of rhinestones as in the picture below until the space is filled. (It helps if you cut the long stripes in half) If there are any gaps betweens rhinestones, then cut a single rhinestone from the row and place into the gap. P.S. The adhesive rhinestones I used were very good. They have yet to fall off. For me this was a temporary addition to my shoes. But of course if you want the rhinestones to permanently stay on, then I suggest purchasing some flat back rhinestones (from amazon.com) and using E6000 adhesive to glue on each piece on to the wedge.